The Dubai Police have distributed 4,000 Iftar meals to blue-collared workers as part of an initiative "to provide Iftar to the fasting people". 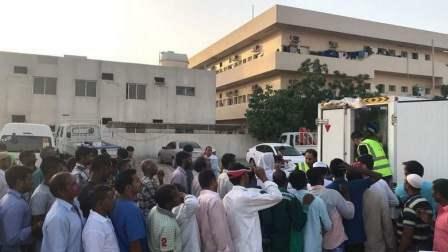 The human rights department of the Dubai Police carried out a campaign to distribute Iftar meals at the workers' accommodations in Al Muhaisnah area. Fatima Al Baloushi, head of awareness and education section at the human rights department, said the Iftar initiative is in line with the Year of Zayed announced by the President, His Highness Sheikh Khalifa bin Zayed Al Nahyan, and also as per the directives of Sheikh Mohammed bin Rashid Al Maktoum, Vice-President and Prime Minister of the UAE and Ruler of Dubai. Al Baloushi said the Iftar initiative aims to provide 30,000 Iftar meals during the holy month of Ramadan, stressing that this noble humanitarian initiative is being implemented in cooperation with the family of the late Obeid Helou.